5 Bdrm Detached Dwellhouse. Ground flr: V/bule. Reception hall. Lounge. Dining rm. Family rm. Kitch/Dining area on open plan. Utility rm. Bdrm. Shower rm. 1st flr: 4 Bdrms, 2 with ensuites & 1 with dressing area. Bathrm (CT band - G). Garden. Garage. Parking. 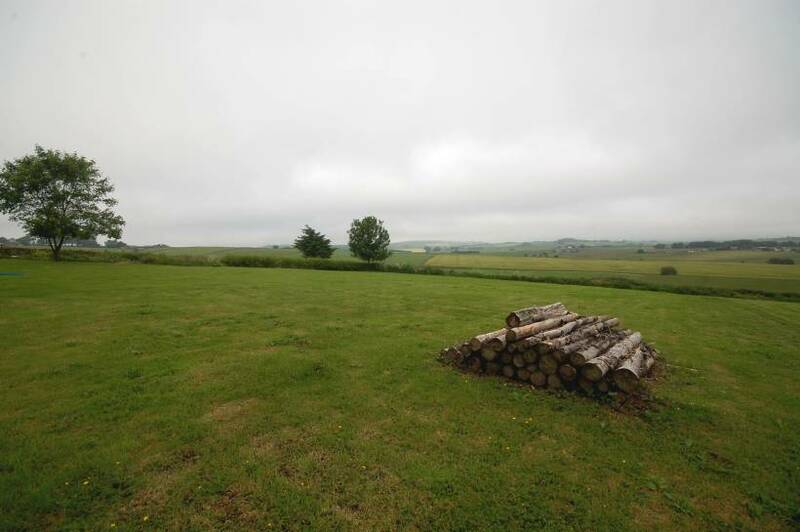 Price over £430,000 Entry by arr. 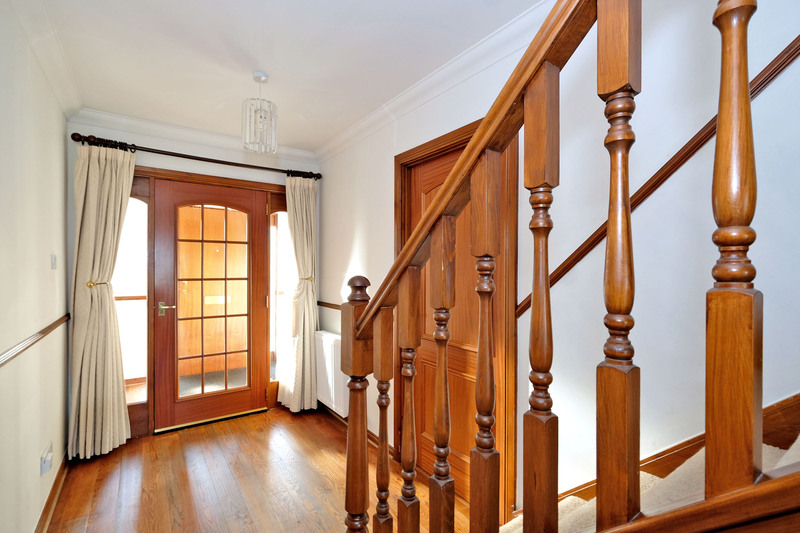 Viewing Hopkinson 07966 460012 or contact solicitors. (EPC band - D). 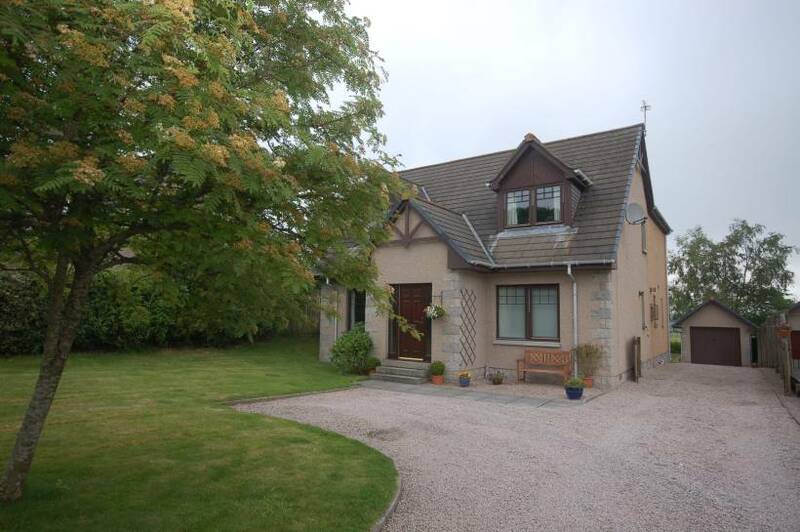 This delightful five bedroomed detached family house offers a perfect opportunity to purchase a highly individual family home in a quiet residential village within easy access of Aberdeen City. Viewing is highly recommended to appreciate not only the standard of the accommodation but also the outstanding views from the property and its unique setting. Notwithstanding its rural location, the property benefits from a high speed and reliable community broadband service enabling home working. Lounge: (17’3 x 12’6 approx.) (5.3m x 3.8m approx)- This well-proportioned public room features a wooden fireplace with slate hearth with working gas effect fire. 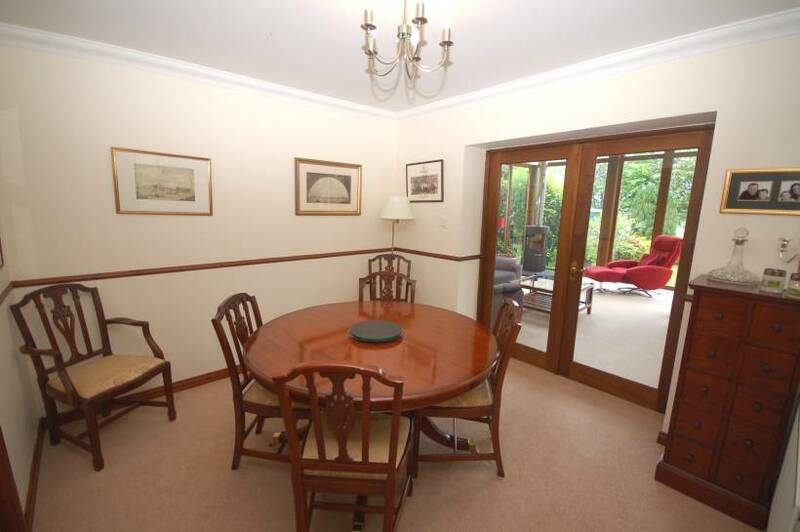 At one end, a large window overlooks the front garden and at the other, French doors lead to the Dining Room. Dining Room: (10’11 x 10’8 approx.) (3.3 x 3.3m approx. )– This well-proportioned Dining Room has French doors to Family Room and access directly to the Kitchen. 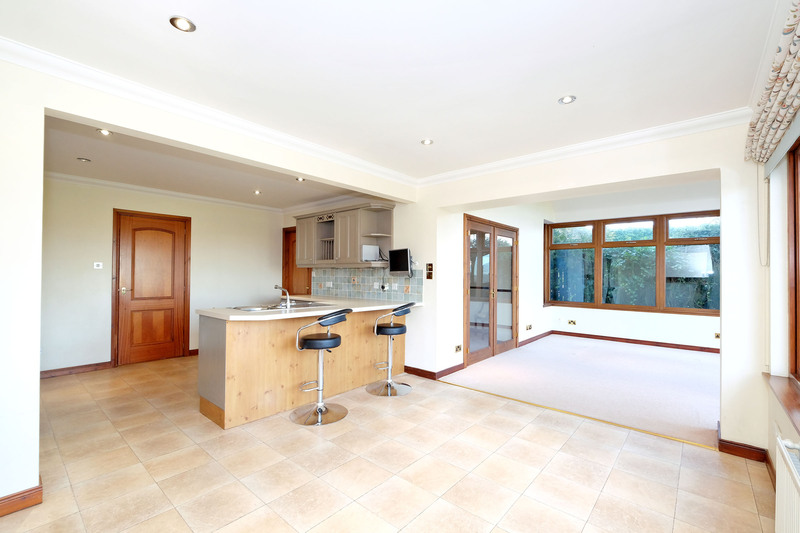 Kitchen with Open Plan Dining Area: (16’3 x 12’6 approx.) 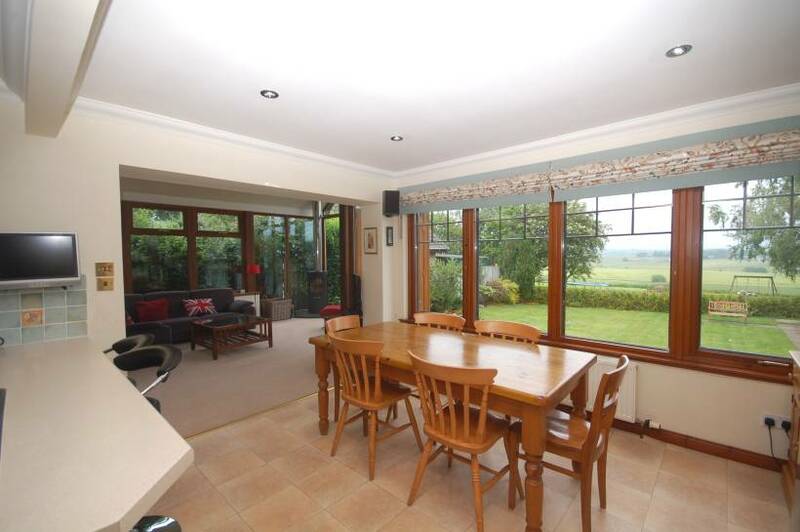 - A full width window offers expansive views over the rear garden, meadow and countryside beyond. 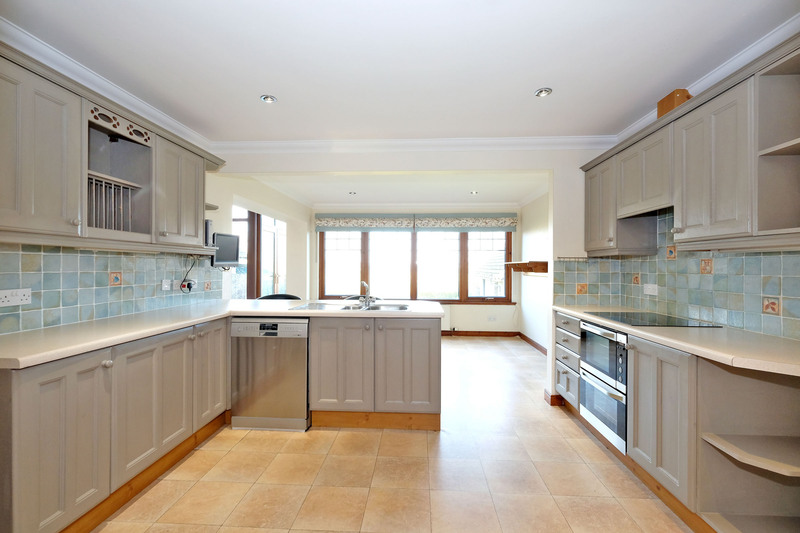 The bright and spacious Kitchen area is fitted with a good range of wall and base wooden units with coordinating work surfaces, stainless steel sink, integrated hob and oven, under unit space housing a dishwasher and space for a free standing fridge freezer. Family Room: (15’9 x 13’4 approx.) (4.8m x 4.1m approx. 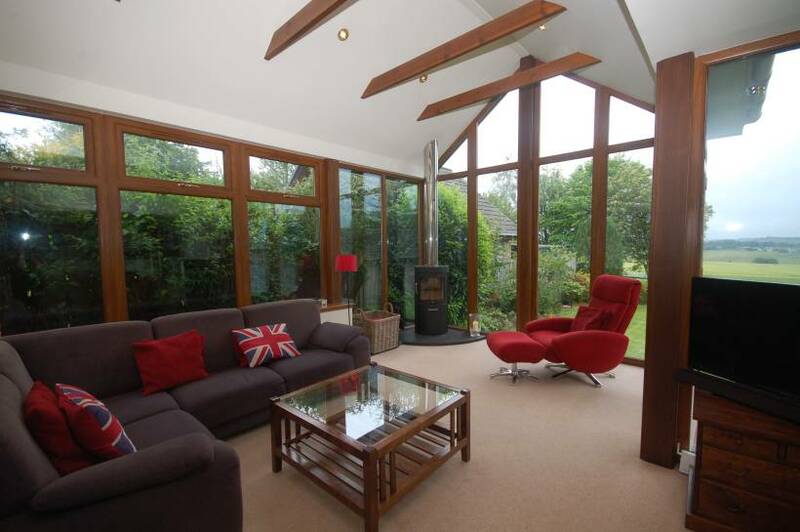 )- Enjoying an abundance of natural light, this spacious Family Room features an attractive gable end window, wooden ceiling beams and a corner Caithness flagstone hearth with HWAM contemporary style wood burning stove. 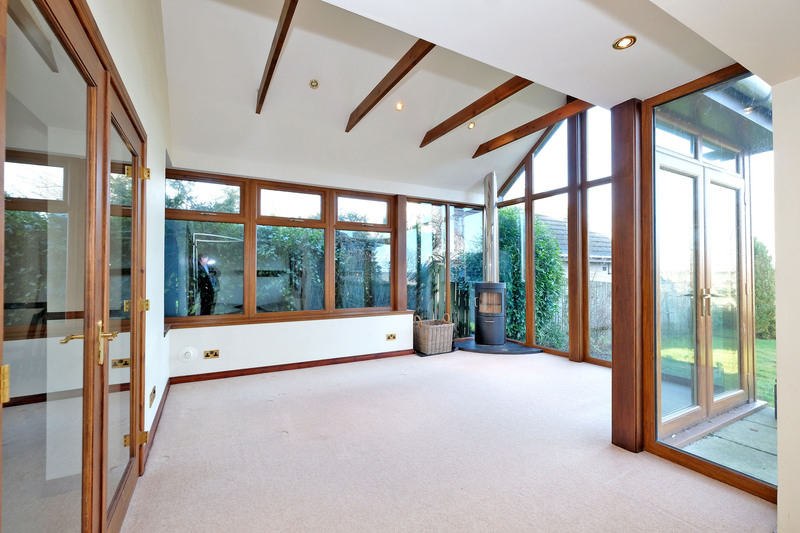 The carpeted Family Area benefits from under floor heating; integrated ceiling spot lights and patio doors leading directly out to the rear garden. Further Reception Room /Ground Floor Bedroom (11’11 x 10’4 approx.) (3.6m x 3.2m approx.) 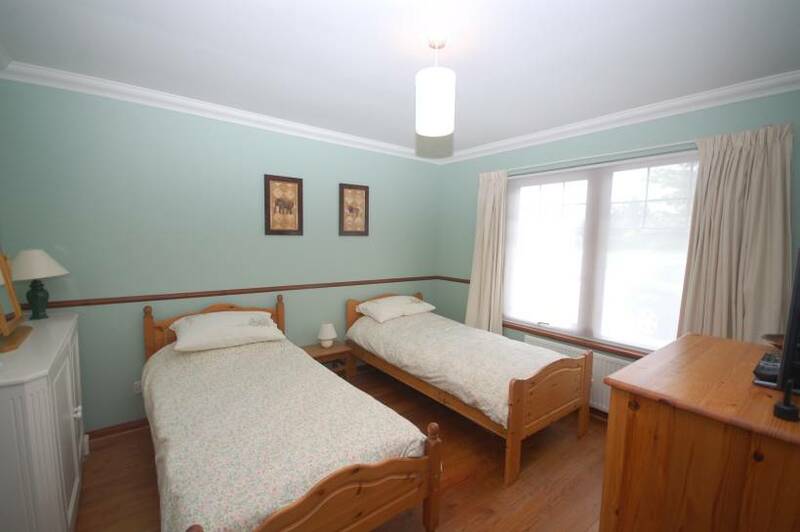 - This room is currently being used as a twin bedroom but it would also make an ideal public room or study, with wooden floor and a large window overlooking the front of the property..
Utility Room: (16’3 x 5’5 approx.) (5m x 1.7 approx.) (Exceptionally spacious Utility Room with a range of wall and base units with coordinating work surface, stainless steel sink, spaces for under unit fridge, washing machine and tumble dryer. Door to rear garden. 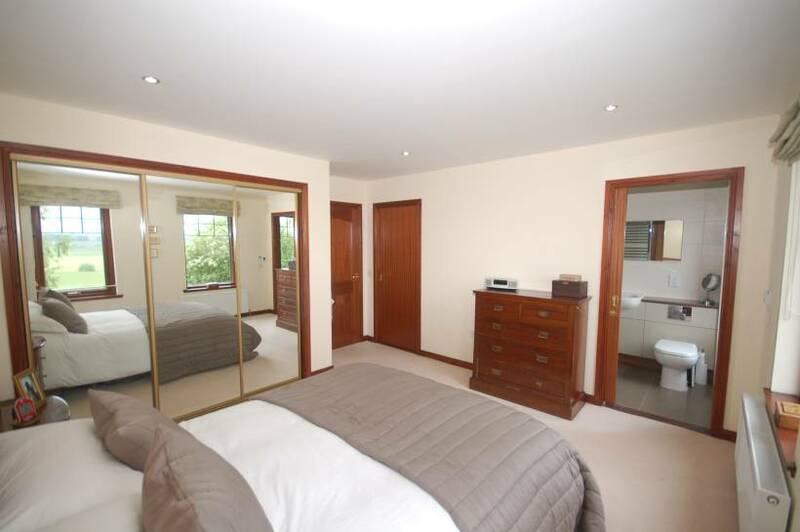 Master Bedroom with En Suite Shower Room: (13’11 x 12’4 approx.) ( 4.2m x 3.8m approx.) 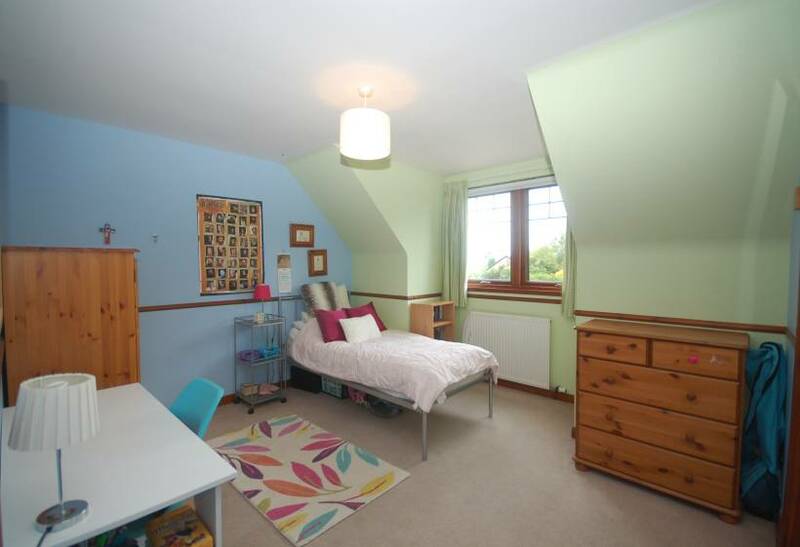 Spacious Master Bedroom featuring two rear facing windows, offering stunning views of the countryside. Triple built-in mirror wardrobes, one of which is shelved, offer considerable further storage space. This room also benefits from a separate built-in dressing area with shelf and hanging rail. 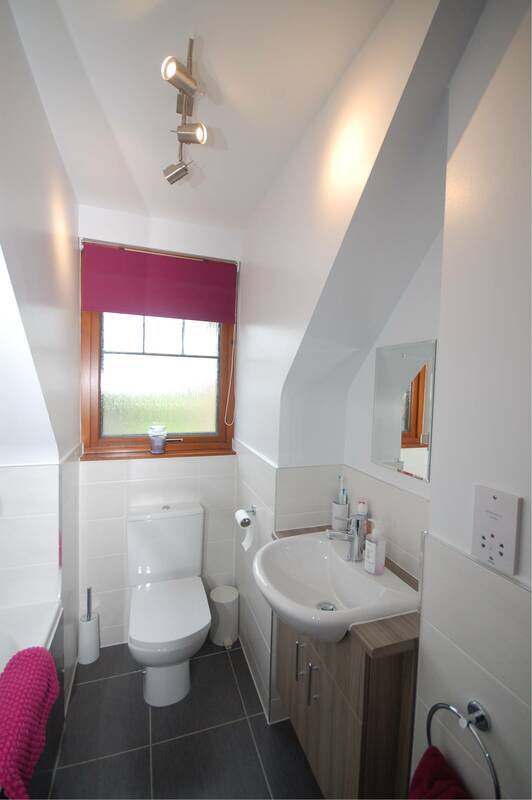 Attractive En Suite Shower Room fitted with white WC and wash hand basin set in vanity unit with Matki walk in shower with deluge and handheld shower heads, heated towel rail; ceramic floor tiles with under floor heating. Bedroom 2 with En Suite Shower Room: (14’8 x 11’8 approx.) (4.5m x 3.6m approx.) Further exceptionally spacious Double Bedroom overlooking the front benefiting from a double slide mirrored door built-in wardrobe with shelf and hanging rail. 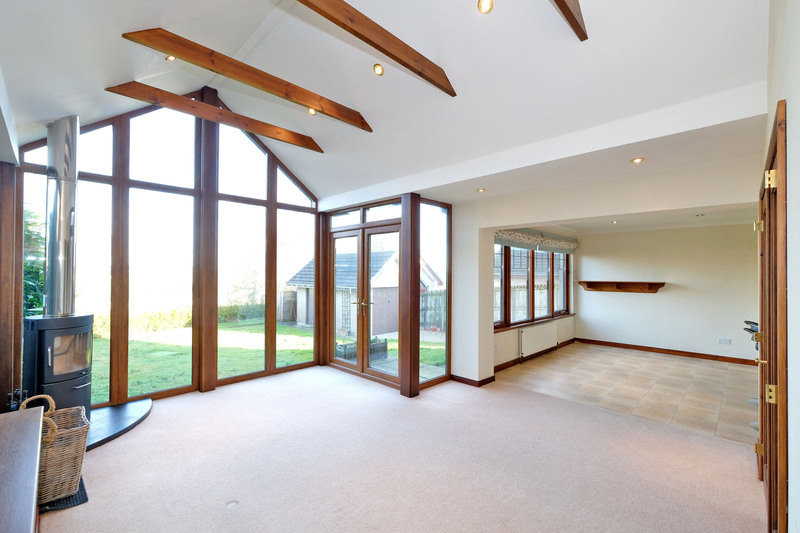 Front facing Dorma window allowing ample natural light into the room. 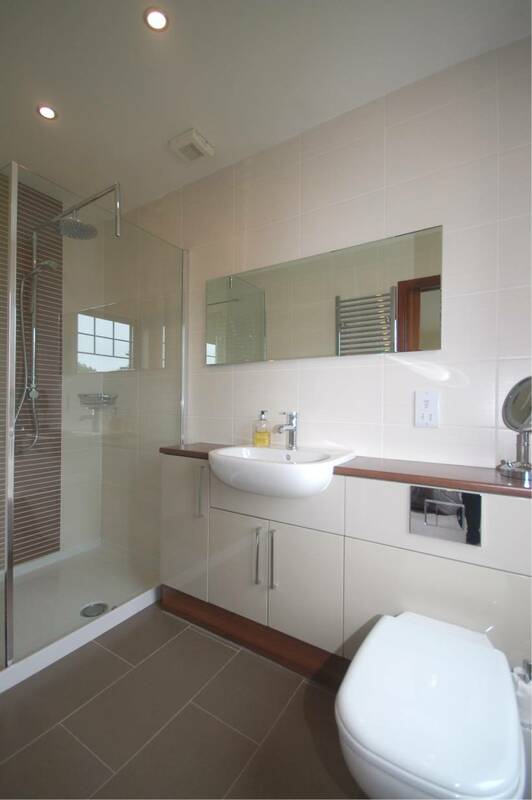 The En Suite Shower Room is fitted with white WC, wash hand basin and fully tiled shower cubicle with a Grohe showerhead. Bedroom 3: (12’9 x 10’10 approx.) (3.9m x 3.3m approx.) 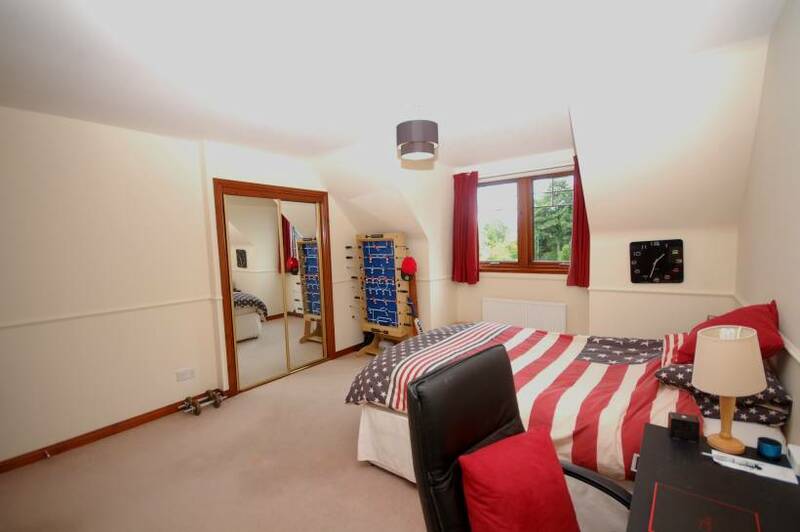 Further spacious Double Bedroom overlooking the front benefitting from a double slide mirrored door built-in wardrobe with shelf, hanging rail and shelving. Bedroom 4: (9’6 x 8’2 approx.) (2.9m x 2.5m approx.) 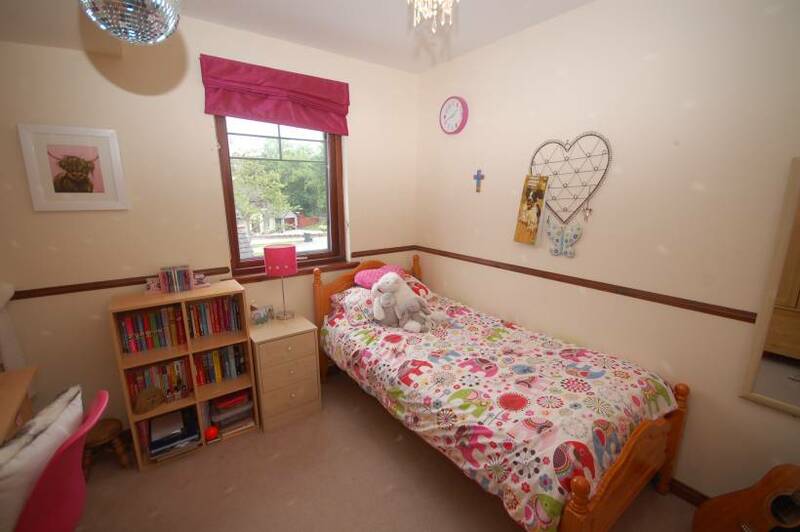 This bedroom overlooks the side of the property and has ample space for free standing furniture. 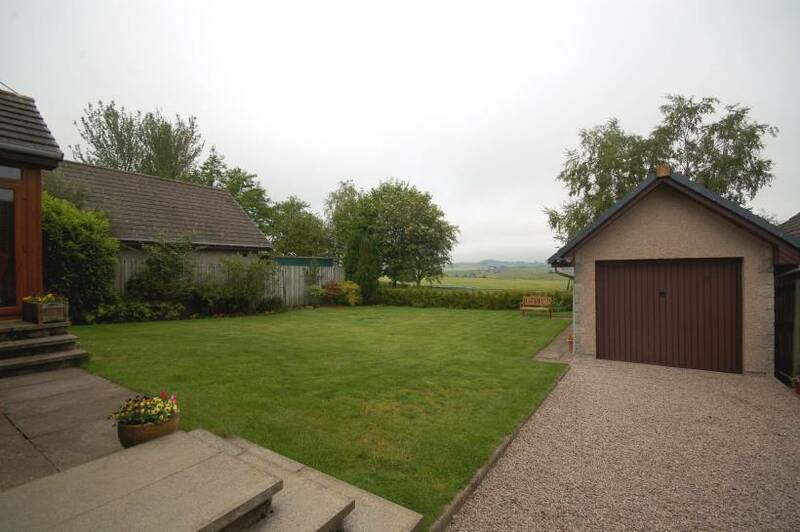 Detached Garage: Up and over door benefitting from power and light, water tap and door to rear garden. Electrical power input for generator to power home circuit. 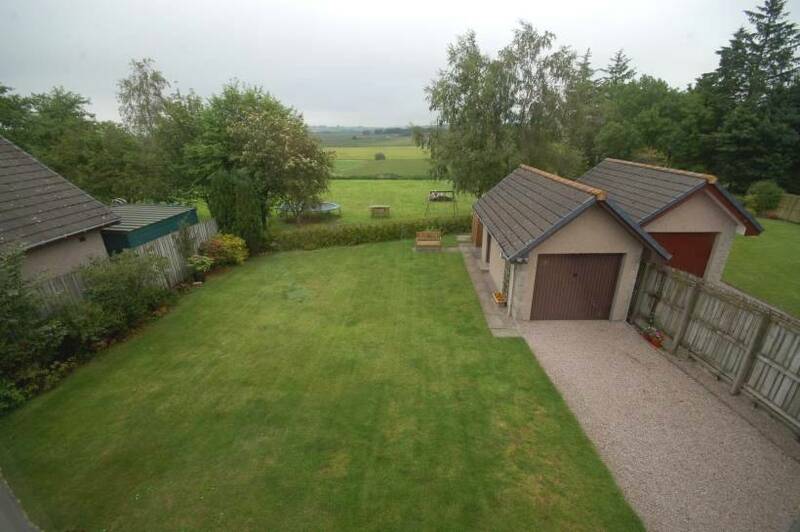 There is also a separate Shed and wood store behind the garage and access from the rear garden to the meadow. 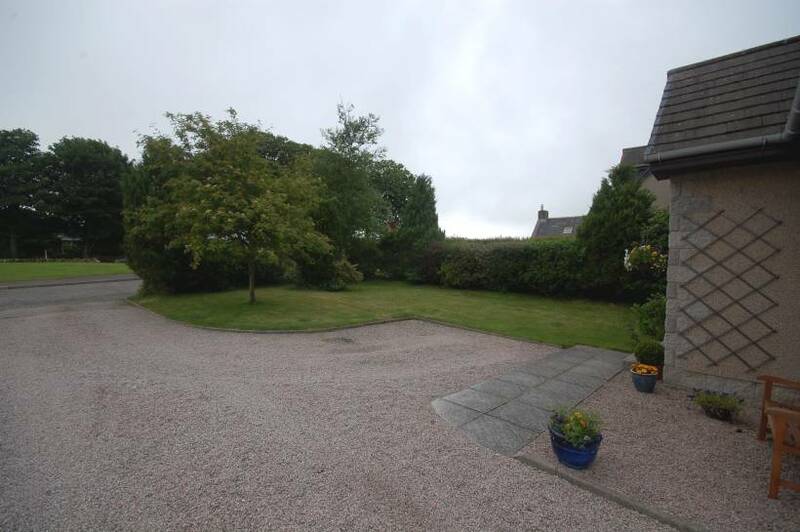 LOCATION Kinmuck is a small country village with easy access of Aberdeen and is particularly convenient for Aberdeen Airport and oil related companies whose offices are located in Dyce, Kingswells, Westhill and Bridge of Don. The completion of the new bypass will further enhance travel into to Aberdeen, Kingswells, Westhill and locations to the South of Aberdeen. The nearest bypass access point will only be five miles away across quiet roads. 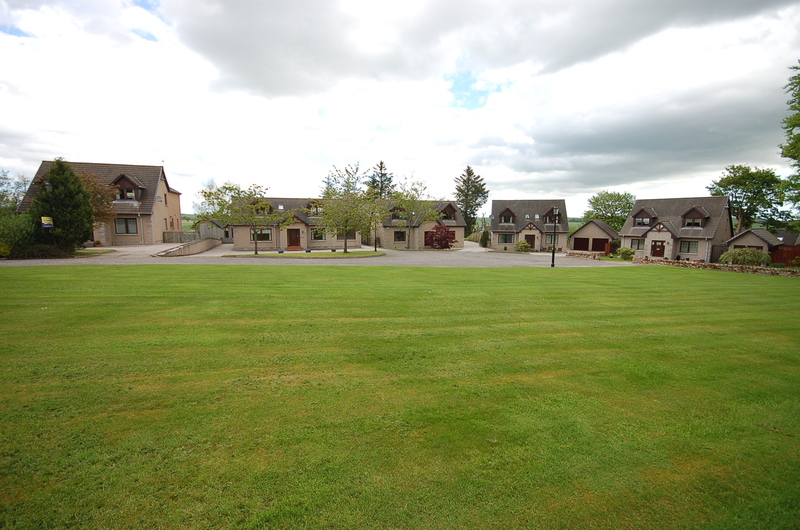 The village is situated two miles from the bustling market town of Inverurie which offers a full range of amenities and facilities. 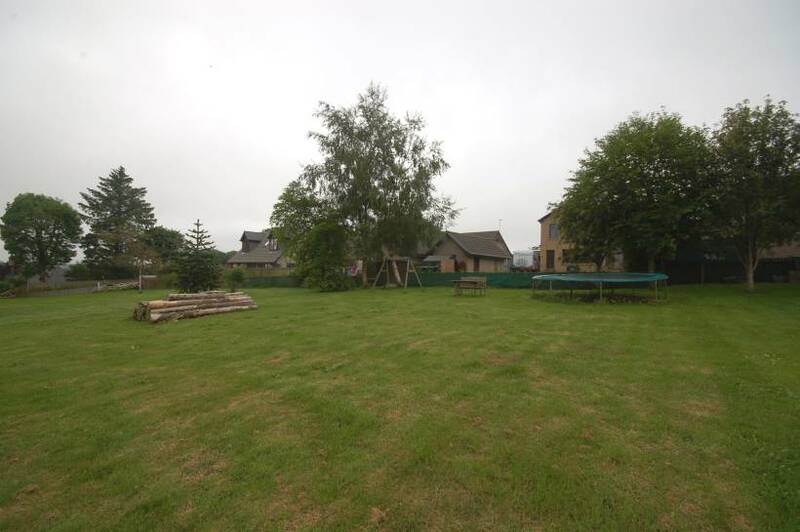 The village of Kinmuck offers primary schooling at Keith Hall Primary School and secondary schooling is available in Inverurie. 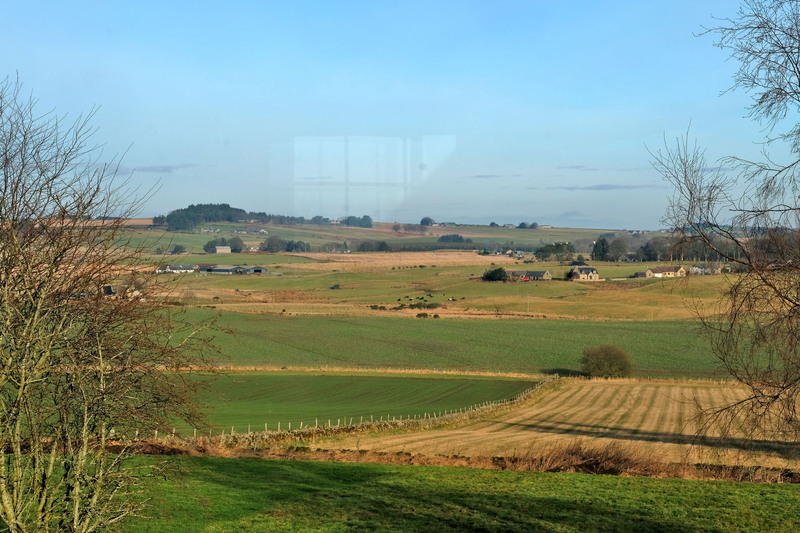 There is a wide range of sporting and recreational attractions available nearby including salmon and sea trout fishing in the River Don and hill and forest walks including at nearby Bennachie hills. 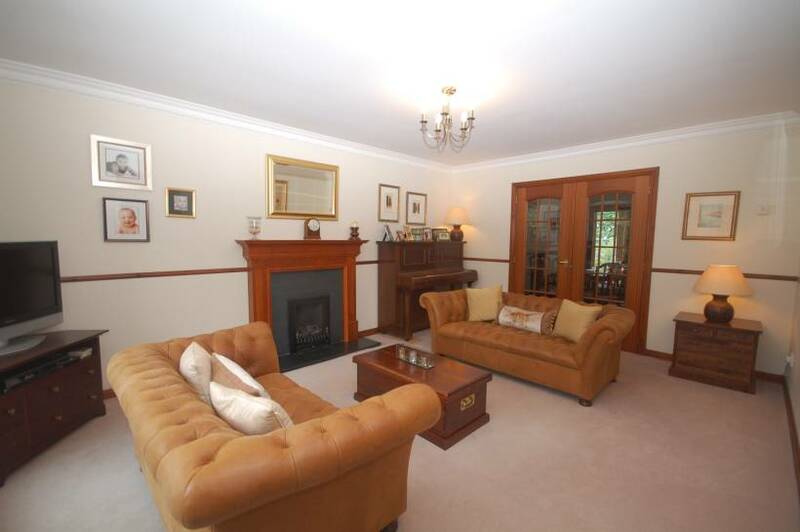 There are a range of golf courses in the vicinity including Newmachar and the prestigious Meldrum House Golf Club. DIRECTIONS Leave Aberdeen in a northerly direction and continue through Dyce and on leaving proceed under the railway bridge. Take the first opening on the left signposted ‘Hatton of Fintray’ and continue along this road for four miles passing though Cothal. Fork to the right, where indicated “Kinmuck – 2 miles”. Continue through the village and the house is on the right hand side, set back from the road.